Home Unlabelled Sabarimala temple and lifting ban on mensurating women into the temple by the Supreme Court!! 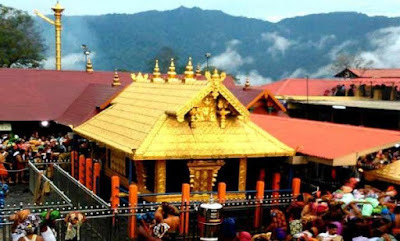 Sabarimala temple and lifting ban on mensurating women into the temple by the Supreme Court!! Women's mensuration is part of the biological activity and in India some temples banned young women;s entry. In almost all Hindu households a few decades ago, maturating women were kept aside for 5 long days and she was used to be treated as a sort of untouchable. In the present wold, things are different and working women on period move around comfortably with confidence. Do women who are yet reach the menopause scan enter holy temples? This topic has been a bone contention for a long time because it involves the place of worship. Hindus revere temples and their divinity as one may see the devotees walking into the temple barefoot. No sandals are allowed to be worn inside the holy premises. Most temples have dress code, In Kerala, men should bare his body above their waist. these customs have been there for a long time. With respect to women on monthly period, it is a different matter.The lifting of the ban on the entry of women into Sabarimala temple, Kerala by India;s highest court has opened the Pandoras Box. A five-judge Constitutional bench of the Supreme Court of India, New Delhi ruled (27 Sept. 2018) in favour of allowing women of all ages to enter Kerala's most famous Sri Ayyappa temple, Sabarimala, thus pulling the curtain down on a centuries-old tradition. The Supreme Court on Setember 27 2018 ruled that women, irrespective of age, can enter Kerala’s Sabarimala temple. The Constitution bench, headed by Chief Justice of India Dipak Misra, pointed out that the provision in the Kerala Hindu Places of Public Worship (Authorisation of Entry) Rules, 1965, which authorised the restriction, violated the right of Hindu women to practise religion. It also said that patriarchy in religion cannot be allowed to trump the right to pray. Only Justice Indu Malhotra (only woman on the bench), who gave a dissenting verdict, said the petition does not deserve to be entertained. She clearly pointed out in the Sabarimala case, that the notions of rationality cannot be brought into matters of religion. She added that the shrine and deity are protected under Article 25 of the Constitution and that it was not up to the court to decide which religious practises should be struck down, except in issues of social evil like 'Sati'. For reasons far beyond our comprehension, certain age old tradition has been vogue in many temples . The Sabrimala’ temple does not encourage the entry of women who have come of age and experienced menstrual cycle. The famous Brahma Temple in Pushkar does not permit married men in the sanctorum and at Kanyakumari Amman temple in Kanyakumari only celibate men are allowed on the inner premises. In the aftermath of this case the role of court comes into focus, adjudicating questions or legal implications related to faith. The British constitution says the church and the state are different. Religious matters should be handled by the responsible,pious people in the society and the court and state should take a step or two backward unless foul and nefarious things going on in religious institutions such as political campaign, religious terrorism, betting houses, etc. Several Hindu organization in Kerala, including the Nair Service Society got into the Bandwagon and stepped up their strong protest against the Supreme Court's recent verdict allowing all women to enter the Sabarimala temple. In many Kerala towns and cities the Sabarimala Karma Samithi members blocked the arterial roads. In Pathanamithitta, devotees organised a prayer procession condemning court's intervention in the historical temple and do away with centuries-old traditions. A preponderance of women, in particular from Kerala and other southern states, are quite angry. Normally most of the Hindu women on monthly period avoid visiting the place of worship or divinity. It is a question of personal cleanliness in a divine place though the almighty is not going to punish them if they visit the temple on such days. So different religions have different faiths and superstitions that have been around for a long time. Determining their implementation or eleminating them is not the duty of courts which are already burdened with long pending court cases. Kerala's Law Minister A.K. Balan asserted the the sporadic protests across Kerala will neither affect nor influence the Government's decision to implement the Supreme Court Verdict. Some Shiva Sena leaders contend that the temple practises and rituals were beyond constitutional interpretation and the verdict discriminated against Hindu traditions. Shiv Sena leaders also pointed out that many sections of the Hindu society supported the ban on disgusting evil practices like Sati and animal sacrifice. As for the ban on the entry of young women attaining puberty into Sabarimala, it has been a cultural tradition strictly followed by the Hindu women on their own accord. In thousands of Hindu temples there is no ban on them, but they, considering their personal hygiene, never visit the temple. The ban on the entry of young women experiencing mensuration has a hidden fact. Decades ago, the path leading to the temple in the midst of thickly wooded areas infested with wild animals. These wild animals would be attracted by the smell emanating from maturating women and might endanger their lives. To rationalists and other groups of people Creating a deity that is celibate and who cannot stand the presence of menstruating women, is preposterous and it shows the male chauvinistic attitude to dominate women - through a set of unreasonable, patriarchal rules. Ever since the 1950s, courts have been dragged into a maze of religious disputes and as they have no time for other cases they should interfere only in cases of seious issues that may affect the normal social life. The Judiciary and the Govenment must distance themslves from the domain of religion unless certain religious customs immense pain and grief to the affected people.